Sarah Carrington (b. 1977) is well known for her evocative paintings of the Isle of Mull, Iona and the coastline around her native Edinburgh. Carrington’s work draws the viewer into the landscape through an expansive range of marks, from exquisite foreground delicacy to bold movement in the distant sky. 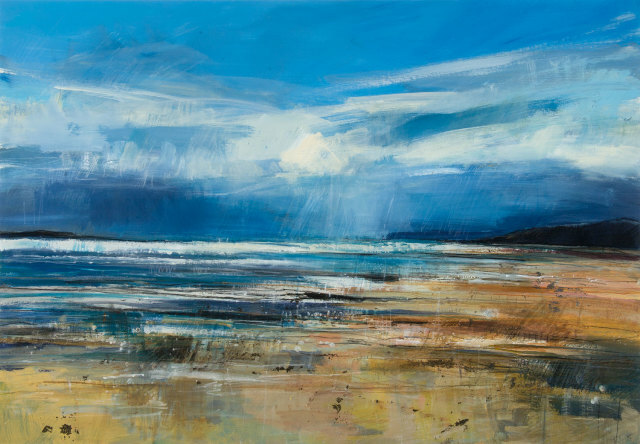 Layers of acrylics, emulsions and oils work alongside inks and chalk to create rich fields of weathered texture and translucent light that capture the shifting moods and spirit of the Northern coastline. Sarah Carrington graduated from Edinburgh College of Art and makes regular journeys back to Scotland from her home and studio in Northern Ireland.